Night markets locally known as ‘Pasar Malam’ are an integral part of Kuala Lumpur’s shopping scene. The origins of the city’s night markets dates back nearly thirty years when they were set up to aid small time traders sell their goods in the evenings and attract the custom of people returning home from office or stepping out for an after-dinner stroll. 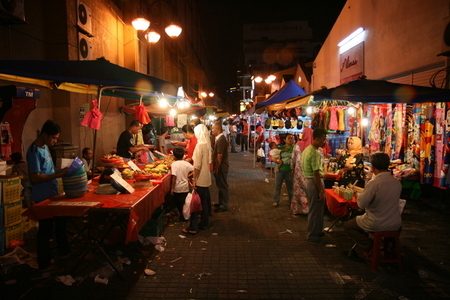 Night markets in Kuala Lumpur are typically held on a designated street between 6pm and 10.30pmon a particular day of the week. They are especially popular in the city’s residential enclaves as they allow locals to do their shopping within the neighborhood. The Pasar Malam usually feature a multitude of vendors who offer a wide range of products like fresh produce, groceries, apparel, cooked local food and snacks, accessories, DVDs, household goods and more. The products are usually priced quite competitively though bargaining is an accepted norm at these night markets. One of Kuala Lumpur’s most famous markets is the Little India night market, which is held along Jalan Abdual Tunku Rahman or Jalan TAR on Saturday nights between 5pm and 11pm. During the day the area hosts various silk and fabric stores but on Saturday nights it is overrun by small street vendors who offer a variety of products like artificial flowers, toys, accessories, trendy apparel and lifestyle products. However the main attraction at this market are its numerous cooked food stalls, that offer a smorgasbord of classic Malay delicacies, some of which cannot be found elsewhere. Local delights offered the stalls include delicious eats like roti tarbus(a white bun stuffed with chili infused meat wrapped in a fried egg), roti kebab(a bun stuffed with thin slices of grilled meat topped with squirts of mayonnaise and barbeque sauce), Nasi Kerabu( fried chicken flavored with galangal and served on a bed of rice), and various other rice and noodle dishes like Mee Reebus, Asam Laksa and Biryani along with the almost ubiquitous Malaysian satays which feature chunks of chicken, ketupat (Malaysian rice cake), beef, fish and tofu. Desert cravings are satisfied by vendors who serve Malaysian sweets like Apam Balik (a small sweet crispy pancake stuffed with peanuts and creamy sweet corn and various Nynonya cakes called Kuihs that are fashioned out of ingredients like sago, pandan and coconut and bear exotic sounding names like Kuih Lapis, Ondeh Ondeh, Talam Ubi amongst others. Funnily enough though the market bears the name ‘Little India’ it is primary Malay in character though it is an enchanting attraction, worth taking in on any trip to Kuala Lumpur.